Martian soil is thought to be enriched with strong oxidants such as peroxides and/or iron in high oxidation states that might destroy biological materials. There is also a high flux of ultraviolet radiation at the surface of Mars. Thus, Mars may be inhospitable to life as we know it on Earth. We examined the hypothesis that if the soil of Mars contains ferrates [Fe(VI)], the strongest of the proposed oxidizing species, and also is exposed to high fluxes of UV radiation, it will be self-sterilizing. Under ambient conditions (25°C, oxygen and water present) K2FeO4 mixed into sand mineralized some reactive organic molecules to CO2, while less reactive compounds were not degraded. Dried endospores of Bacillus subtilis incubated in a Mars surrogate soil comprised of dry silica sand containing 20% by weight K2FeO4 and under conditions similar to those now on Mars (extreme desiccation, cold, and a CO2-dominated atmosphere) were resistant to killing by the ferrate-enriched sand. Similar results were observed with permanganate. Spores in oxidant-enriched sand exposed to high fluxes of UV light were protected from the sporocidal activity of the radiation below about 5 mm depths. Based on our data and previously published descriptions of ancient but dormant life forms on Earth, we suggest that if entities resembling bacterial endospores were produced at some point by life forms on Mars, they might still be present and viable, given appropriate germination conditions. Endospores delivered to Mars on spacecraft would possibly survive and potentially compromise life detection experiments. The results of life-detection experiments performed almost three decades ago on Mars by the Viking lander have long been subject to controversy [1–3]. Many scientists, though certainly not all [3, 4], have concluded that results of Viking biological experiments can be interpreted as an indication of the presence of strong oxidants in the Martian soil [5–7], rather than biological activity. They suggest that these oxidants are capable of oxidizing organic materials causing release of carbon dioxide as seen in the Viking experiments. Since oxygen was also released after humidifying a sample of Martian soil, these proposed oxidants would also oxidize water. The spontaneous reduction of Ferrate(VI) in water forms molecular oxygen and Fe(III) . The rate of this reaction is strongly pH dependent . Other observations by Viking have complicated data interpretation, including the transient absorption of generated carbon dioxide, perhaps indicating an alkaline soil. Also, different thermal sensitivity of carbon dioxide and oxygen released implied that more than one oxidant might have been involved in the observed processes or that biology might indeed have been responsible for the observed results . Goldfield, et al. and Tsapin, et al. suggested that the actual source of oxidative power of Martian soil could be highly redox active oxygen species formed in the atmosphere by ultraviolet (UV) irradiation, and Hunten  examined this hypothesis much earlier. Further, these oxidative equivalents may then be stabilized in the form of high oxidation states of some elements that are particularly abundant in Martian soil. The most likely element is iron, which is thought to represent a major fraction of the Martian soil matrix [12, 13]. Iron has a set of oxidation states between +2 and +6, with the higher oxidation states being very strong oxidants. The reduction potential of FeO42- in acidic conditions has been determined to be E0 = +2.20 V and in alkaline conditions E0 = +0.72 V . Thus, these authors [5, 10] proposed that Fe(VI) as ferrate dianion FeO42-, which is more stable under alkaline rather than acidic conditions, might be an important component of the pool of Martian oxidants. They demonstrated that Fe(VI) displays the essential features of organic oxidation to carbon dioxide and water decomposition to oxygen that were found with Martian soil during the Viking biology experiments. Goldfield, et al. further propose that the presence of a strong oxidant such as ferrate would make the Martian surface self-sterilizing, eliminating the possibility for detection of life, or its remnants, on that planet. In support of their hypothesis, they conducted spectral and polymerase chain reaction (PCR) experiments with Fe(VI), finding that it destroys DNA, nucleotides, proteins, and amino acids. It is quite possible that iron in the +5 and/or +6 oxidation states is present in the soil of Mars. However, recent observations by the Mars Odyssey orbiter indicate that significant amounts of water ice exist at or near the surface of Mars . Since transient temperatures above freezing occur at some locations on Mars , this water likely would be present at least briefly in the liquid form. Under slightly alkaline conditions, as found on Mars, and in the presence of liquid water, Fe(VI) reacts quickly with water and is oxidized to Fe(III). Thus, in regions where liquid water forms even briefly, Fe(VI) is less likely to exist. However, Mars is a relatively large planet, and conditions across its surface vary. We cannot assume that iron exists in the same oxidation state(s) everywhere on Mars. It is possible that some regions of Mars might harbor Fe(V) and Fe(VI), while regions with a frequent occurrence of liquid water might be dominated by Fe(III). Also, it is possible the Fe(VI) if removed might be reformed in a continuing cycle through interactions with the planet's atmosphere. Stoker and Bullock  examined the oxidation of glycine under simulated Martian conditions and concluded that any organic matter brought to the Mars surface by meteorites likely would be destroyed by UV radiation faster than it might be delivered. They further suggested that no organic compounds found on Mars by the Viking Lander Gas Chromatograph Mass Spectrometer experiment could be explained without invoking the presence of strong oxidants in the surface soils. They felt their estimates of the organic destruction rate caused by irradiation at the Mars surface were an upper limit for a globally averaged biomass production rate that might be comparable to the slow-growing cryptoendolithic microbial communities found in dry Antarctica deserts . An alternative hypothesis is that given the possible presence of ferrate in the soil, the present environmental conditions on Mars are not highly conducive to ferrate-based oxidation reactions, including those potentially affecting dormant and hostile-environment-resistant life forms. Mars is exposed to high fluxes of UV radiation and is very dry (atmospheric water = 210 ppm) and cold (average temperature is about 218 K, -55°C, -67°F) with only traces of oxygen and with an atmosphere composed mostly of carbon dioxide (CO2 – 95.32%; N2 – 2.7%; Ar – 1.6%; O2 – 0.13%; CO – 0.08%; H2O – 210 ppm; NO – 100 ppm; Ne – 2.5 ppm; HDO – 0.85 ppm; Kr – 0.3 ppm; and Xe – 0.08 ppm) . Thus, in this work experiments were performed to further examine the possibility that a Martian soil containing significant amounts of ferrate might be self-sterilizing due to the highly reactive nature of Fe(VI). Here synthetic K2FeO4 was prepared and added to dry silica sand at a concentration of 20% by weight. Dry endospores of the bacterium Bacillus subtilis were then added and the mixture incubated under a simulated Mars environment (carbon dioxide atmosphere at -20°C) for a period of weeks. Results were examined for indications of whether or not the presence of ferrate in and of itself was sufficient to make the Martian surrogate soil self-sterilizing over a non-geologic time frame. The potential sporocidal activity of a combination of a powerful soil oxidant (permanganate) and high fluxes of UV light was also examined. Finally, our data were discussed in light of published literature regarding the possible survival of ancient bacteria in earthly environments. The United States and other spacefaring nations are required by treaty to protect Mars and other non-earthly planetary systems from contamination by earthly microorganisms. 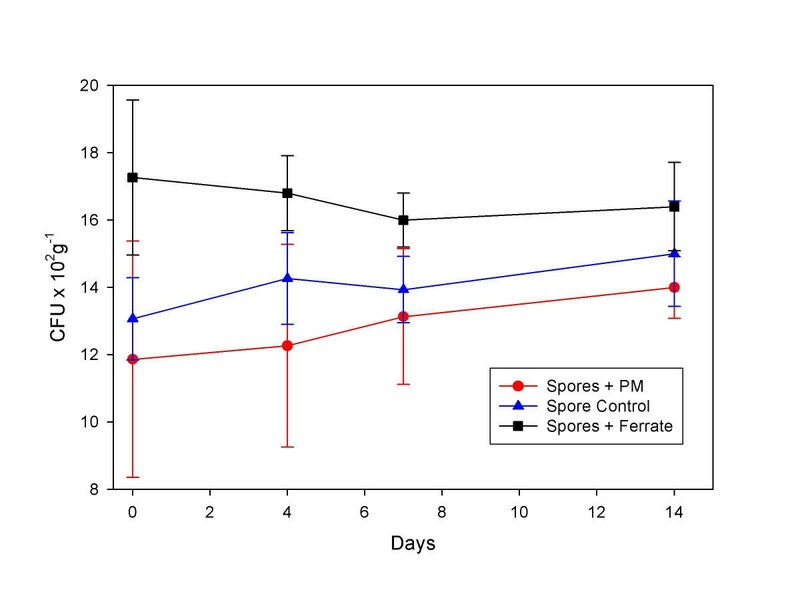 From work reported here, it appears that environmentally robust endospores, if delivered to Mars on spacecraft, could survive for extended periods of time in the cold, dry, preserving environment of Mars, despite the presence of strong oxidants in the soil. Under ambient environmental conditions, synthetic ferrate(VI) degraded some organic molecules mixed into sand. For example, five mg of ferrate removed about 10 mg of 2,4,6-trinitrotoluene (TNT) from the reaction mixture (Figure 1). However, a mixture of dodecane and hexadecane was not degraded in the ferrate(VI)-soil mixture (Figure 2). 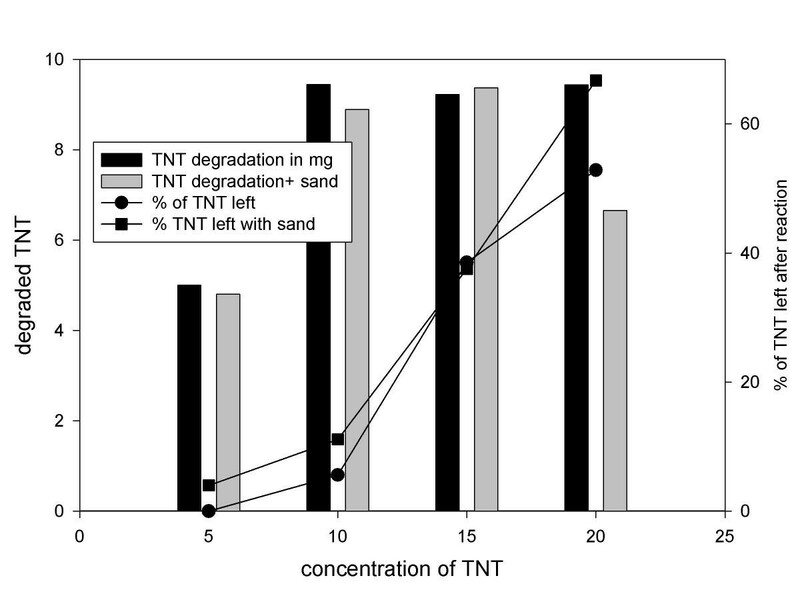 The degradative activity toward TNT was dependent on the addition of water. All the organic moieties were stable in the dry sand-ferrate mixture. Degradation of 2,4,6-trinitrotoluene (TNT) by potassium ferrate in the presence and absence of sand. The 5 mg of ferrate used removed about 10 mg of TNT. The Y-axis shows mg of TNT added to each microcosm. The Y-axis shows the amount (mg) of added TNT degraded or the percentage remaining after the reaction. 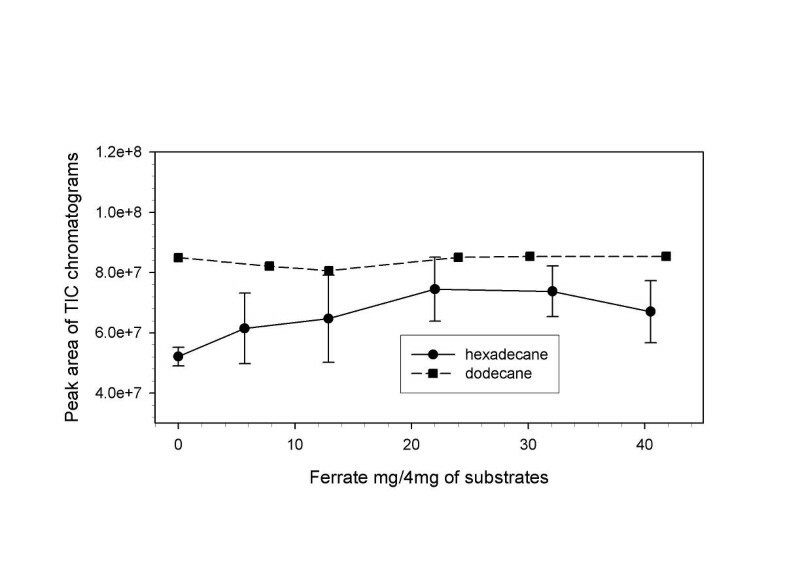 Degradation of aliphatic hydrocarbon – dodecane and hexadecane in the presence of potassium ferrate. ▪, dodecane; ∙, hexadecane. Incubation time with ferrate was 1 hour. An incubation over 24 hours produced similar results. Each data point represents the mean of three replicate experiments. Error bars represent +/- one standard deviation of the three replicates. The Y-axis shows integrated peak areas of analytes directly related to concentration. The X-axis shows the amount (mg) of K2FeO4 added to reaction mixtures containing 4 mg of hydrocarbon. Results of spore survival over time in the control and ferrate(VI)-enriched or permanganate-enriched Mars surrogate soils under simulated Martian environmental conditions are shown in Figure 3. The endospores survived exposure to high levels of ferrate under the imposed conditions for the duration of the experiment (up to six weeks). At the times of sampling, the surrogate soil suspensions contained the characteristic crimson color of ferrate(VI) (Figure 4) or similar color of permanganate. After spreading on the agar medium, the ferrate present in the inoculum was reduced over 30 minutes to give a characteristic brown oxyhydroxy polymer precipitate of Fe(III) residue on the plate surface, indicating that ferrate(VI) was stable under the simulated Mars conditions and had been available as a potential biocide for the duration of the experiment. Spore survival was similarly high in a surrogate soil containing permanganate in place of ferrate. An important observation relevant to the Mars environment was that transient exposure of spores to K2FeO4 in the presence of liquid water was not sporocidal. Once Fe(VI) is reduced to Fe(III), a rapid process, it becomes non-toxic to the spores. Survival of Bacillus subtilis endospores after exposure to ferrate- and permanganate-enriched sand under simulated Mars environmental conditions. ▲, Silica sand only; ▪, Sand + ferrate; ∙, Sand + permanganate; -20°C; ferrate and permanganate added at 20% by weight of silica sand; CO2 atmosphere; -20°C. Each data point represents the mean of three replicate experiments. Error bars represent +/- one standard deviation of the three replicates. CFU = colony-forming units per gram dry weight of sample. The X-axis shows the number of days of exposure to ferrate prior to viable counting. Experiments carried out for 6 weeks showed no statistically significant decline in CFU. 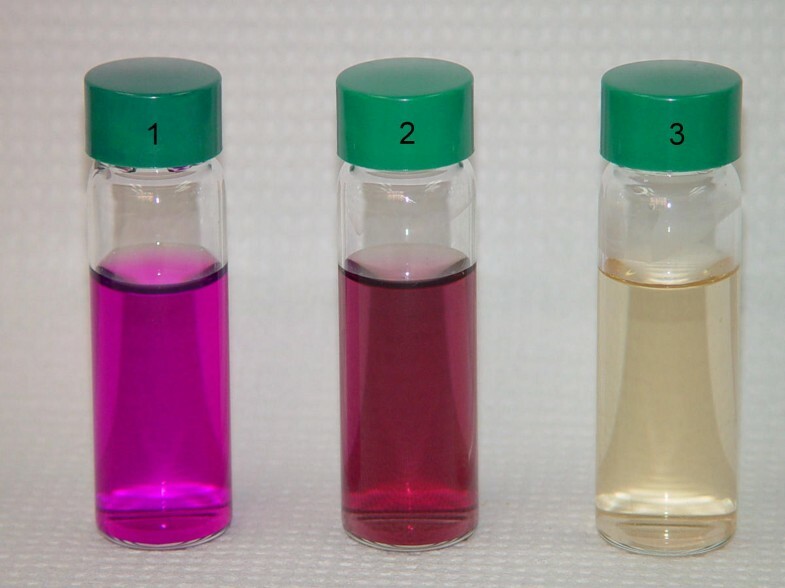 Characteristic colors of 10 mM water solutions of K2FeO4, KMnO4 and Fe2 (SO4)3. 1 = Permanganate; 2 = Potassium ferrate; 3 = Ferric chloride. Spores placed into a dry permanganate-enriched surrogate soil and exposed within a column to a sterilizing flux of UV light at the column surface were killed within only the first 5 mm of the column (Figure 5). This was in the presence of air and at a temperature of 25°C. Survival of Bacillus subtilis endospores after exposure of Mars surrogate soil to the sterilizing radiation of UV. Each data point represents the mean of three replicate experiments. Error bars represent +/- one standard deviation of the three replicates. CFU = colony-forming units. The X-axis shows the depth range (mm) of the sample taken for viable counts after 96 hours of exposure to UV light. Ferrate(VI) is a very strong oxidizing agent and will readily oxidize many organic molecules in aqueous solution [19–21]. High oxidation power selectivity and by-production of non-toxic Fe(III) make potassium ferrate(VI) an environmentally friendly oxidant for removal of industrial contaminants from natural waters . We confirmed this degradative activity of ferrate using 2,4,6-trinitrotoluene (TNT), though a mixture of dodecane and hexadecane, as might be found within microbial membranes, was not degraded by ferrate(VI) (Figures 1 and 2). Fe(VI) is known to be highly active in water as a biocide. For example, the kinetics of inactivation of a bacteriophage by potassium ferrate was studied with the F-specific RNA-coliphage Q beta. Inactivation in phosphate buffer (pH 6, 7, and 8) containing ferrate was effective and could be described by Hom's model . The effectiveness of ferrate(VI) in wastewater treatment has been studied, and it exhibits a strong bactericidal effect on both coliforms and total bacteria . However, the conditions used in those prior experiments with ferrate(VI) do not at all mimic the conditions that might be encountered on the surface or in the subsurface of much of Mars, where there is thought to be essentially no available water , there is a highly oxidized atmosphere of mostly CO2, and average temperatures are very low (typically -60 to -80°C, but sometimes reaching temperatures near 0°C in areas of sunlight). These Mars-like conditions were used in the experiments reported here. Certainly these conditions did not exactly duplicate the Martian atmosphere, which would have required use of a vacuum chamber. The pressure of CO2 used was much higher than on Mars. However, since CO2 is unreactive, the higher pressure should not have significantly affected the results. It is of course possible that at very low CO2 pressures endospores might be more sensitive to their environmental conditions than at one atmosphere. This experiment will require a more sophisticated apparatus than is presently available to us, though we hope to obtain such equipment soon in order to further examine this question. It is likely that liquid water exists at least transiently on the surface of some locations on Mars . Because of the high reactivity of ferrate with water, especially under alkaline conditions, it is likely that these locations on Mars contain iron mostly in the non-toxic Fe(III)-oxyhydroxide state. Also, endospores were not killed by transient exposure to ferrate in the presence of water at room temperature. Thus, the transient occurrence of liquid water in the soils of Mars is insufficient reason to reject the general conclusion that if ferrate is present in the soils of Mars, it probably is not a sporocidal agent. In locations where other forms of iron dominate, spores would be even more stable. However, additional experiments looking at spore survival that involve additions of small amounts of water (e.g., 1% w/w) to a Mars surrogate, ferrate-enriched soil, with brief fluxes of temperature between -80°C and about +5°C would be useful to further address this question. Though UV light is a potent biocide and is present at high levels on the Mars surface, beneath the surface or under objects such as rocks, even the natural high flux of ultraviolet radiation on Mars will likely be greatly attenuated. We tested this hypothesis, confirming that spores are protected from the UV flux, even in the presence of a strong soil oxidant (permanganate), by a few mm of soil cover. The UV light, provided by a mercury vapor lamp, was not filtered to exactly duplicate its passage through the atmosphere of Mars, though this might be accomplished with the appropriate apparatus (e.g., an irradiated vacuum chamber). The intervening gas was normal air at about 21% oxygen, 0.03% CO2, and 78% N2. This clearly did not filter enough of the lethal wavelengths (e.g., 254 nm) to significantly affect the strongly sporocidal quality of the light. On Mars, however, the thinner atmosphere might allow better passage of other shorter lethal wavelengths (e.g., around 200 nm) that might be filtered to some extent under the conditions used here. However, the likely effect of the difference in light wavelength filtration on Mars versus the experiments described here would be the ultimate soil cover depth needed to protect spores from UV damage, and this difference is likely not to be very large (less than an order of magnitude). 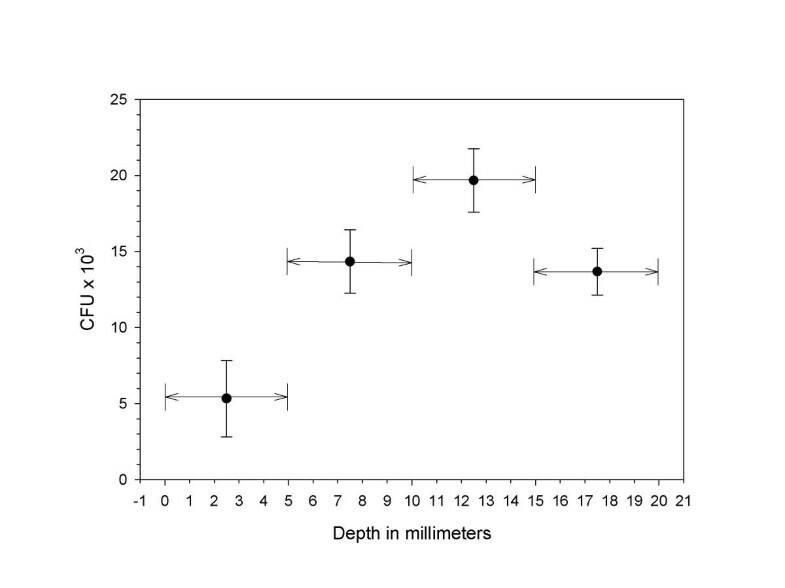 Also, some endospores are considerably more UV-resistant than those we employed , and substitution of such spores likely would have changed the results (survival vs. depth) to some degree. The important observation is the demonstrated protective effect of soil materials. Earthly life forms can produce dormancy structures that are highly resistant to adverse environmental conditions, including the presence of chemical oxidants and ionizing radiation, conditions that are thought to occur on Mars. Bacterial endospores are a prime example of resistant dormancy structures, and recent research indicates that such dormant forms of bacteria can survive for even millions of years, under appropriate conditions. Cano and Borucki  revived a bacterial spore from the abdominal contents of extinct bees preserved for 25 to 40 million years in buried Dominican amber and cultured and identified it. Greenblatt, et al. reported successful culture of bacteria from Israeli (Lebanese lode) amber dated at 120 million years old. Vreeland, et al. reported the isolation and growth of a previously unrecognized spore-forming bacterium (a Bacillus species, designated 2-9-3) from a brine inclusion within a 250 million-year-old salt crystal from the Permian Salado Formation. Due to the difficulty in absolutely excluding modern contamination as sources of these isolates, these reports have been controversial. However, to date these claims have not been invalidated . Thus, even studies of earthly systems indicate that under environmental conditions possibly less life preserving than those encountered on Mars, dormant life forms may have survived on Earth for very long periods, even of geological time scales. The most important factor for such survival appears to be desiccation, a defining characteristic of amber, earthly brines, and much of the Mars environment. Though there apparently is water in the soil of the polar regions of Mars (Mars Odyssey mission observations), it is thought to be present as ice and probably is not biologically available. Little work has been done in the study of microbial survival in the extraterrestrial environment. Horneck, et al. did observe survival of a significant fraction of Bacillus subtilis spores after 11 months of exposure to the space environment on board the European Retrievable Carrier (EURECA). They exposed spores of Bacillus subtilis to space for about two weeks in the BIOPAN facility of the European Space Agency onboard the Russian Earth-orbiting FOTON satellite. The spores were exposed under a variety of conditions: in dry layers without any protecting agent; mixed with clay, red sandstone, Martian analogue soil, or meteorite powder; or in "artificial meteorites" (cubes filled with clay and spores in naturally occurring concentrations). Unprotected spores in layers open to space or behind a quartz window were completely or nearly completely inactivated, and similarly low survival was obtained behind a thin layer of clay acting as an optical filter. Survival was increased by five or more orders of magnitude when the spores in the dry layer were directly mixed with powder of clay, rock, or meteorites. Up to 100% survival was reached in soil mixtures with spores comparable to the natural soil to spore ratio. These data confirm the deleterious effects of extraterrestrial solar UV radiation but also confirm that thin layers of clay, rock, or meteorite can successfully shield spores from UV damage if they are in direct contact with the spores. Mileikowsky, et al. considered the probability of natural transfer of viable microbes from Mars to Earth in meteoroids ejected from Mars during the period 4 Ga BP to the present and during the 700 Ma from Ga 4.5 to 3.8. They used NASA's HZETRN transport code to calculate probabilities, examining many variables potentially affecting microbe survival. The species modeled used the environmentally robust bacteria Bacillus subtilis (spore-former) and Deinococcus radiodurans (highly radiation resistant). Their modeling suggested that if microbes existed or exist on Mars, viable transfer to Earth is not only possible but also highly probable, due to these microbes' impressive resistance to the hazards of space transfer and to the dense traffic of Martian meteorites that have fallen to Earth since the dawn of our planetary system. Here the hypothesis was examined that if the surface soil of Mars contains significant amounts of ferrate(VI), it will be self-sterilizing. Dried, but living dormant endospores of Bacillus subtilis were incubated in a Mars surrogate soil containing 20% by weight of K2FeO4. Incubation conditions similar to those now on Mars (dry, cold, and a CO2-enriched atmosphere) were used. Under these conditions the endospores were not immediately killed but in fact were resistant to inactivation by the ferrate-enriched or permanganate-enriched soil (Figure 3). Though some delay in colony formation compared to controls was observed upon addition of water prior to plate counting, the Bacillus spores survived both storage in a ferrate-rich soil and the brief simultaneous presence of ferrate and water during analysis. This simple experiment indicates that ferrate does not necessarily provide an environment that is self-sterilizing on non-geological time scale. It is possible that a thin coating of ferric hydroxide on the surface of our ferrate crystals might have afforded some protection to the spores from ferrate exposure since small traces of water vapor might still have been present despite our attempt to exclude it. However, this coating would likely be only a few angstroms thick (ferrate was of very high purity at > 99% pure) and probably was insignificant compared to the overall amount of ferrate present. This is supported by the observation that the presence of an alternative strong oxidant that does not have the potential for such a coating (permanganate crystals at 20% w/w final concentration) also did not kill the endospores supports this (Figure 3). The finding that organic molecules were degraded only after the addition of water to the soil also supports the inactivity of ferrate under Mars conditions. Significant amounts of liquid water are thus required for ferrate's degradative or biocidal activities. Ferrate must be in solution in order to act as an oxidant. Assuming the soil of Mars contains about 1% by weight of water, mostly in the form of ice [15, 32–34], complete thawing would fail to approach the slurry conditions used here to accomplish oxidation of TNT (30 mg surrogate soil + 60 mg liquid water). Even these saturated conditions did not promote the oxidation of hydrocarbons. The traces of water (~200 ppm) in the Martian atmosphere  might also form thin layers of rust on soil particles there, making the surrogate soil system used here even more like the proposed ferrate-enriched soil of Mars. The data (Figure 5) show that below the immediate surface, high fluxes of UV radiation in the presence of strong oxidants are attenuated and are not sporocidal. If dormancy structures similar to endospores were produced at some point by life forms on Mars, data reported here suggest they could still be present and viable. This might actually be demonstrated, as in the surrogate soil experiments described here, with Martian soil samples. Rejuvenation experiments could be performed remotely in situ or in a contained laboratory setting after return of samples to Earth. The first such experiment in fact was essentially performed in the original biology experiments aboard Viking, though the results were inconclusive. The experiments need to be repeated, with modifications based on all we have learned in the succeeding years. There are now improved ways to monitor microbial signatures and metabolic processes that are indicative of life in soil [35–37]. The fact that spores appear to survive for many decades and perhaps hundreds of millions of years in earthly systems further supports the possibility for survival of similar life forms on Mars. The conditions on Mars might actually be even more conducive than those on Earth for long-term survival of such living entities because of the unique combination of cold, dehydration, lack of oxygen, and protection from direct UV exposure. In the original Viking experiments where investigators searched for organic compounds in Martian soil , four samples were examined (one surface and one subsurface sample from each of two locations). Gas-chromatography/mass-spectrometry at a sensitivity of parts per billion (ppb) for some compounds yielded negative results. Presumably, if microorganisms had been present, organic compounds would have been detected. However, these results suffer from the limitations of all negative results. They cannot prove the absence of life since there was the inherent limitation of analytical sensitivity, and only two locations close to the landing site on the Martian surface were examined. One endospore weighs approximately 10-13 g. Assuming there were one such spore per gram of Martian soil, and one could detect 100% of the organic matter in that spore, this would require an analytical sensitivity of 0.1 ppb. In reality the organic matter in a cell or spore contains many classes of compounds with few classes representing more than a few percent of the total, and considerably less than 100% efficiency in extraction and detection is possible. Thus the actual sensitivity required for Viking to detect 1 spore / g of soil would have been in the ppt range. Detection of 1000 spores / g would have required at least 1 ppb sensitivity. These requirements are well below the sensitivity of the GC/MS used aboard Viking. However, techniques based on growing of cells from spores or measuring their physiological activity after germination, not performed by Viking, could provide a sensitivity as low as a few spores / g of soil . It has been suggested that the oxidizing nature of the Martian soil is due to the photochemical reactions that create hydrogen peroxide and superoxides in the surface soil. Using data obtained from the Viking gas exchange experiment and assuming that all oxygen came from H2O2, the concentration range of hydrogen peroxide has been calculated to be 25–250 ppm . Some soil bacteria survive at a concentration of 30,000 ppm of H2O2 , suggesting that presence of this peroxide alone on Mars surface would not make the soil "self-sterilizing." Mars of course has been dry and cold for a very long time, and it is not possible to run experiments such as ours over geologic time scales. It may be that an oxidant like ferrate(VI) might be biocidal over periods lasting millions of years, even in the dry cold-storage environment of Mars. However, we conclude that the occurrence of ferrate(VI) in Mars soils, if present, will not necessarily promote immediate self-sterilization of the soils. The United States and other spacefaring nations are required by treaty to protect Mars and other non-earthly planetary systems from contamination by earthly microorganisms. Bacterial endospores that are particularly resistant to agents such as disinfectants (e.g., vapor-phase hydrogen peroxide), extreme desiccation, and even gamma radiation are the most common contaminants found on surfaces of cleaned spacecraft assembled in spacecraft assembly clean rooms . These survivors include cultivable species such as Bacillus licheniformis, B. pumilus, B. cereus, and B. circulans, as well as other strains that have not yet been cultivated but can be observed through their DNA 16S rDNA fingerprints. From work reported here it appears that such robust spores, if delivered to Mars on spacecraft, could survive for extended, if not indefinite, periods of time in the cold, dry, preserving environment of Mars, despite the presence of strong oxidants in the soil. This might compromise later experiments aimed at detecting life on the Red Planet, and/or influence its future ecology over geologic time scales. Crimson-colored Fe(VI) as potassium ferrate K2FeO4 was prepared and stored (dry) according to the method of Thompson, et al. . Its purity and state of oxidation was confirmed by an oxidimetric titration using arsenite-cerate method . This method measures only Fe(VI and V), leaving any ferric ions in the preparation unreduced. The fresh K2FeO4 was 99% pure. Two sets of reaction mixtures were prepared. Treatment mixtures contained 25 mg of pure silica sand as a soil surrogate, about 5 mg K2FeO4, and different amounts of the nitrated organic compound 2,4,6-trinitrotoluene (TNT); amounts of TNT were 5, 10, 15, or 20 mg. A control set contained only TNT and sand. All experiments were prepared using four replicates. All samples were twice mixed by vortexing and centrifuged for 2 min at 16 kG in order to remove reagents from walls of vials. There was no detectable reaction at this step. To every vial 60 ul of deionized water were added. Reactants were mixed, centrifuged, and incubated for 15 min at room temperature. After 15 min, 1 ml of methanol was added; about 40–50 mg of sodium sulfate were later added to remove water from the mixture. After vortexing, the reaction mixture was centrifuged for 4 min at 16 kG. Supernatant was diluted 20× in methanol for electrospray tandem mass-spectrometric analysis (ES-MS/MS) or 20× in acetonitrile for gas chromatography/mass spectrometry (GC/MS) analysis. Similar experiments were performed using hexadecane and dodecane. GC/MS was used for quantitative measurement of TNT and hydrocarbon concentrations in soil extracts. Sample (2 ul) was injected into the GC using a HP 7683 series injector (split-less injection). The mass spectrometer's (Hewlett Packard 5989A) scan range was from 50 to 800 Da. Temperature of the source was held at 250°C and of the quadropole at 120°C. The ion source was set on positive electron impact ionization mode. The temperature of the injector on the gas chromatograph (Hewlett Packard 5890 series II) and the MS interface was 280°C. For separations, we used a Phenomenex ZB-5 column (30 m × 0.25 mm × 1.25 μm). The initial oven temperature was 100°C, held for 1 minute. This was increased 10°C per min until the final temperature of 300°C, which was held for 3 min. Perfluorotributylamine was used for auto-tuning the MS. Pure silica sand (Fisher) was dried by heating overnight at 110°C and then stored in desiccators containing calcium chloride. Potassium ferrate was added (see below) to a level of 20% (w/w) and mixed thoroughly into the sand to form a Mars surrogate soil. The soil was used for microbiological experiments as soon as possible after preparation (always less than 24 hours). The second soil was prepared similarly, substituting KMnO4 for K2FeO4. Control soil contained only sand. Our own laboratory strain of Bacillus subtilis was grown in a simple yeast extract-based broth through late logarithmic phase of growth and allowed to sporulate. The spores were collected by centrifugation, washed twice with 100 mL of sterile water, freeze dried, and stored under desiccation until used. The bacterial strain used is a typical Bacillus subtilis strain and is available from the corresponding author upon request. Microbiological experiments were performed, with data points collected in triplicate, using small microcosms comprised of 50mL serum bottles. Surrogate soil (100 mg/microcosm) and spores (about 2 × 104 per gram of soil) were placed together into the bottles. To ensure complete mixing and uniform exposure of all cells or spores to the ferrate component of the soil, they were first suspended in a small amount of sterile water. This was thoroughly mixed into the sand fraction of the surrogate soil, which was then lyophilized. The ferrate component of the surrogate soil was next thoroughly mixed into the microbe-enriched, dry sand within a sterile laminar-flow hood, and the bottles were flushed with pure CO2 and sealed with sterile stoppers and crimp seals. The CO2 was provided from a bottle of reagent-grade carbon dioxide (>99% purity) as compressed gas and was scrubbed to remove traces of oxygen and water. The microcosms were sparged with multiple volumes of gas under normal atmospheric pressure. The sealed microcosms were immediately placed in a freezer at -20°C. Periodically, triplicate bottles were removed and opened for analysis. A small amount of water (1 ml) was added and 0.1 ml of the suspension was quickly removed using an aseptic technique and spread onto a plate of nutrient agar (Difco). The plates were incubated at 30°C and then examined periodically for outgrowth of Bacillus subtilis colonies. Plates were inoculated in triplicate and colony-forming units determined after 24 hours and again after 48 hours of incubation. Controls without ferrate were run simultaneously. Similar experiments were performed after replacing ferrate with an equal amount of potassium permanganate. A surrogate soil containing 20% (by weight) permanganate in sand was inoculated with spores of Bacillus subtilis and placed within a Forma Scientific UV-illuminated laminar-flow hood under its full UV illumination and in the presence of air for 96 hours. The open surface of the microcosm was placed approximately 50 cm from the 15-watt mercury vapor light source. The hood is calibrated annually for effectiveness, and under these conditions will produce 108 per cm2 spore kill on a metal surface within 24 hours. Then exposure samples were removed progressively from the surface in 5 mm increments and plate counts performed for surviving spores. Data represent counts from three replicates. Error bars show one standard deviation. Untreated controls taken at time 0 contained about 2.0 × 104 spores in a similar size sample. The authors thank Agnieszka Mazus and Anna Kolodziejek for technical assistance in the laboratory and Sarah Koerber for her editorial improvements of our manuscript. We thank the (anonymous) referees for their constructive comments. RLC conceived the study and directed the overall project. AP directed the analytical and synthetic chemistry portions of the work. LA performed the microbiological experiments described here. All authors read and approved the final manuscript.